Every year, as April approaches, Mount Everest is snapped out of its winter slumber by a bustle of activity at its base. A team of Sherpas, known as ice doctors in mountaineering parlance, get together to figure out the best way through the Khumbu Icefall. It is the first obstacle that climbers encounter in their bid to get to the top of the highest mountain in the world. Soon, the base camp gets inundated with teams from around the world; this will be their home for the next few weeks. Reunions and acclimatization climbs on other mountains in the vicinity keep most occupied as they await the one announcement—that the route to the top has been opened. 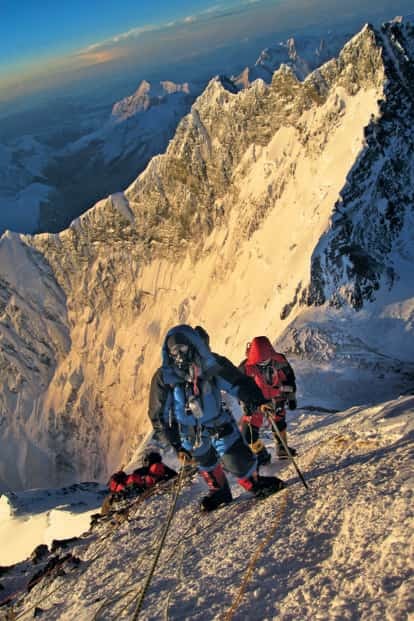 This essentially means that the mountain has been fixed with ropes from base to summit, and teams can now proceed with preparations for the climb. A year ago, the mountain recorded the highest number of commercial summiteers in its history—an incredible 319 made it to the top, not to mention the 329 high-altitude guides, who had been hired to support these paying clients. Two decades back, in 1997, when commercial climbing was slowly finding its feet, those figures stood at 54 and 31, respectively (all figures according to The Himalayan Database). These days, come spring, a party of sorts unfolds at the base of Everest; quite literally too, considering DJ Paul Oakenfold’s gig at the same venue last year. Climbing the Everest today just isn’t the same as it used to be, when mountaineers stood at the base of the mountain and attempted to solve a puzzle that ended—if all went well—with a gorgeous view from the top. An unsuccessful climb only made the resolve stronger when they returned to the mountain the next time. It took Doug Scott two unsuccessful attempts before he became the first British climber atop Everest, alongside Dougal Haston, in 1975. “I was in a bathtub and in a difficult domestic situation when I received a phone call from (another climber) Don Whillans in March 1972 to go climb the Southwest Face of Everest. I was obsessed with big wall climbing, so I went," Scott says. “It was wonderful to have the mountain to ourselves, with time to stand and stare and reflect on all and everything. With the large number of high-altitude tourists now allowed, these would be places I would like to avoid like the plague. What could be worse than going to the Himalayas to spend weeks with a thousand or more people jostling for place on the mountainside?" Scott’s ire is justified, given the era he is from, and the sheer numbers at the base camp today. Commercial expeditions have made the Everest accessible to mountaineering enthusiasts who aspire to take on the challenge and bask in the attention that comes with becoming an “Everester". “I’ve seen people’s status change overnight from one Mr Jack to Everester Jack. Ever heard of a K2er Jack or a Makaluer Jack?" says Kuntal Joisher, who says he went relatively unnoticed when he climbed Manaslu, which is one of the fourteen 8,000ers, in 2014, before making headlines when he summited the Everest two years later. The 38-year-old Mumbai resident managed to climb the Everest on his third attempt and is among the first few practising vegans to stand atop the mountain. One doesn’t have to go very far to understand the allure of the Everest. This season, Joisher hopes to climb the Lhotse—the fourth highest mountain in the world, and just across the ridge from Everest. 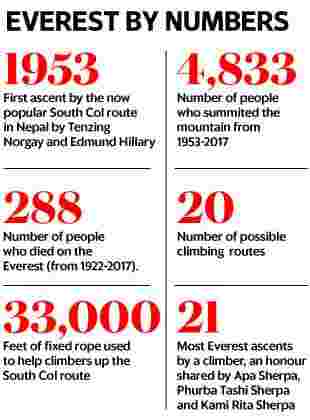 While 4,833 separate climbers have reached the top of Everest till date, just 678 have scaled the Lhotse. This, despite the fact that while the permit cost for climbing the Everest is $11,000 (around Rs7 lakh), for any of the other eight 8,000m peaks (8,000ers) in Nepal, it’s just $1,800. Behind this stark contrast in numbers is a tale of dreams and aspirations—at times, even desperation—which, ironically, has fudged the definition of a mountaineer today. It isn’t odd these days to hear of aspiring climbers arriving at the base camp and then learning the bare essentials needed to walk up a mountain, such as jumaring or clipping into the line. Or of a client getting to the top while roped up and carried on the strength of a Sherpa. “In 2017, I was witness to climbers getting their crampons fixed above advance base camp, by their Sherpas of course. On the north side, one can even drive to the base camp by jeeps," says Ralf Dujmovits, the first German to climb all 14 8,000ers. “People appear ill-prepared for climbing the Everest—no responsibility, lack of experience, and not enough training. Still, with the support of strong Sherpas, many make it to the summit—and mostly back to base camp, luckily!" What makes this worth an argument, first, is the crowding caused on the Everest’s slopes by these inexperienced climbers. Truth is, to climb the highest mountain in the world, the only real prerequisite these days is the ability to afford the climbing fee. Nepal leads the way for the most number of Everest summiteers (1,288), and a large number of them are Sherpa guides. After the Nepalese come summiteers from the US (598), India (355), the UK (337), China (298) and Japan (180). Also in the top 10 are summiteers from Russia, Canada and France. “The danger is not the mountain any more, it is the number of people on it. And I do not call them mountaineers," says Wilco van Rooijen, a Dutch climber who has climbed the Everest and K2, among other mountains. Since climbing the Everest in 2016, Joisher has received a number of queries from aspirants, and is often left aghast at what he hears from them as “prerequisites" for climbing the big mountains. “In India, there is no real Everest mentor. Most people have no clue how to get physically or mentally ready for the Everest. Instead of building some mountaineering experience, they are told—Nun karo aur Everest jao (climb Nun and go climb the Everest). Or go to Stok Kangri in the winter—and they don’t even climb the mountain. Last year, around 30% at the base camp were Indians, 30% Chinese, and the rest were from other countries," Joisher says. There have been a few proposals to limit the number of novices, such as a climber needing the experience of having scaled a few 6,000-7,000m mountains and at least one 8,000m peak, before being eligible for the Everest, which is 8,848m. “It would have the benefit of distributing income from high-altitude tourism beyond those living in the shadow of Everest," says Scott, who is also the founder of Community Action Nepal, a UK-based charity which works to improve the quality of life for the people of Nepal and help sustain their local culture. But all that was implemented was a ban, last year, on solo ascents. There was also a proposed ban on blind and double amputee climbers, but this was stayed by Nepal’s Supreme Court. “In trying to solve the significant issue, that is, a lack of professionalism on the Everest, targeting minority groups is never going to work. It needs to be based on an individual’s actual ability, not someone’s characterization of it. People are dying today because they are poorly advised, prepared and resourced," says Mark Inglis from New Zealand, the first and only double amputee to have climbed the Everest. “It is more about the quality of the climb. For instance, Mount Cook in New Zealand is a very difficult climb, yet ‘only’ 3,724m. Many so-called Everest climbers would die doing it," he adds. The accessibility of Everest is another reason that commercial climbing has picked up faster in these parts. In comparison, just the hike to the base camp of K2, the second highest mountain in the world, is an arduous walk that takes a few days. When Van Rooijen attempted the K2 in 2008, there were only six teams at the base camp; the Everest had 61 teams the same year, according to 8000ers.com and The Himalayan Database. From 1922, the year of the first recognized attempt, till 2016, 288 people had died on the Everest, with a death rate of 4%, writes Everest watcher Alan Arnette in his blog alanarnette.com. In comparison, the K2 has witnessed 86 deaths, with a death rate of 23%. “Commercial expeditions have reached the K2, but the frequent bad weather and the steep mountain makes it harder to climb," says Dan Mazur, a climber who has summited the Everest and K2 and now leads clients. “The K2 is too challenging to guide successfully and consistently. There have been guided climbs on it, but it’s not going to reach the status of Everest with respect to the numbers. The challenges on K2 are far greater than Everest, but most aspirants want to climb the highest and not the second highest (peak). The commercial guiding on K2 will consist of smaller groups with more experienced, amateur climbers and a higher guide-to-client ratio," say Ed Viesturs, who climbed the K2 in 1992, en route to summiting all the 14 8,000ers—the only American to do so. For years now, the Sherpa community has been a vital cog in the Himalayan mountaineering wheel, supporting expeditions as porters and high-altitude guides. A majority came from the Solu-Khumbu region in the shadow of the Everest, which has been their home ever since they migrated from Tibet in the 17th century. Many moved to Darjeeling in search of work in the first decades of the 20th century, where they were first hired by expeditions as porters to carry rations. Soon, they became vital companions for climbers in the high mountains and were crucial to the success of any climb. “The services rendered by our Sherpa porters on the mountain were quite outstanding and deserve fuller treatment than the short, largely statistical notes that space permits here," wrote J.O.M. Roberts, transport and administrative officer of the 1963 American expedition to the Everest, in The Himalayan Journal. While Sherpa climbers have registered many firsts, the fact is that a lot of their efforts go relatively unnoticed when it comes to commercial climbing. Mingma Tenzi Sherpa, 34, started climbing mountains with an ascent of Island Peak in 1993. For the next few years, he continued climbing 6,000m peaks, until he was handed an opportunity to climb the Lhotse in 2007. He went on to climb the Everest seven times and is set to lead an Everest-Lhotse expedition this season. “The climbers have increased over the last decade, as has the success rate. We often get inexperienced climbers and we suggest they climb some lower mountains before attempting the higher ones. But if they refuse, we usually teach them the basics at base camp before the ascent," he says. A major reason for accommodating inexperienced climbers is the bonus at stake should the client reach the summit. This is a sum that is predetermined by the trekking agency in consultation with the Sherpas and the clients. Each season (usually March-May), depending on the conditions on the mountain, a Sherpa can make about Nepalese rupees (NPR) 7-8 lakh (around Rs4-5 lakh) if they’re on an 8,000er, and some even go for the summit twice, should another teammate be unable to do so. Each Sherpa is insured for a sum of NPR 10-15 lakh, usually by the trekking agency that hires him, as people from the Sherpa community work as freelancers. Yet veterans like Apa Sherpa, who has climbed the Everest a record 21 times, believe more needs to be done for the community. “Safety is the first criteria for Sherpas, but, unfortunately, this is not the case. Many of my friends have died climbing the Everest. There are a lot of things that expedition organizers or the Nepal government can do—some of the immediate needs are better pay, compensation for the family if there is an accident, and support for the education of Sherpa children," Apa says. Worry for his family is one reason Apa called time on the Everest after his final climb in 2011. These days, he prefers to hike on smaller mountains in the US, where he has relocated. “My first and last climb (1990 and 2011, respectively) were equally important and exciting to me. I loved climbing the mountains but it was incredibly hard for the family. My wife wanted me to stop a long time ago, however this was the only way I could financially support them. To respect their feelings and spend more time with them, I retired from climbing," he says. As a professional guide and a constant observer of the Everest and its environment, Mazur realized that the human waste generated on the mountain each season was simply being hauled down to Gorak Shep, near the Everest base camp, and dumped in open pits. Water contamination and environmental degradation due to this have become a reality over the years. According to the Sagarmatha pollution control committee, about 12,000kg of human waste is generated at the base camp each year, 80-90% of it during the spring climbing season. Mazur teamed up with Garry Porter, an engineer by trade and a retired Boeing programme manager, in 2010, to address the issue. Mazur used his knowledge of biogas digesters and the two looked into the feasibility of implementing the technology at high altitude near the Everest. “Bench-level testing of human waste was run by Kathmandu University. We had specific objectives to validate engineering models—if the mini-digesters were held at a range of temperature, human waste would break down and methane gas would be produced and used for cooking and lighting. This could potentially reduce the reliance on burning wood and yak dung, which leads to pulmonary diseases," Potter says. The duo co-founded the all-volunteer, non-profit company Mt Everest Biogas Project in April 2010 to raise funds and build the system, which will eventually be handed over to the Nepalese government. “This cutting-edge technology can be extended to other cold weather, high-altitude human waste problems globally. Without having Everest as the proving ground, it may be difficult to develop the technology elsewhere," Mazur adds. Solid waste is another issue in these parts—most of it is simply burnt off due to overflowing landfills, resulting in the release of toxic gas, and contaminating groundwater sources. “Thousands of kilos of solid waste was flown out of Lukla (a village in Khumbu with the airstrip) recently and given to recycling outfits in Kathmandu, which is great news. This is needed on an yearly basis, as well as the prohibition of plastic, encouragement of recycling practices for lodge owners and incentives for them and trekking agencies to become better stewards of the landscapes they’re making such a great living off," says Alton Byers, who co-managed the High Mountains Adaptation Partnership (HiMAP) from 2011-15 and documented changes in the glacier systems of the Everest region. HiMAP works to raise global awareness of the critical importance of high mountain glacial watersheds. “Commercial climbing has brought prosperity to the Khumbu region, but usually at the cost of environmental impact. The need is to now find a real solution to the chronic mountain-climbing and mountain-use problems. This would represent not only the right balance between economic growth and high mountain conservation, but also the future of sustainable mountaineering," says Byers. There are other transformations taking place that only seasoned Everest watchers experience—such as those brought about by climate change. On the one hand, improved weather-forecasting techniques and secured routes have eliminated some of the risks associated with climbing the high mountains. At the same time, however, climate change has led to changing weather patterns, making storms more sudden and unpredictable, which could catch climbers by surprise. “Because the mountain is generally warmer and easier to climb these days, people are bringing less gear and going light and fast. This means that when a storm arrives, climbers are less prepared for it," says John All, director of the Mountain Environments Research Institute at Western Washington University. Climate change is also changing physical conditions on the mountain. Navigating the Khumbu Icefall is turning out to be a more precarious proposition these days. The constantly shifting, unstable mass of ice seracs is usually navigated before the sun comes out, to reduce chances of an accident. It is considered one of the most dangerous hurdles on the route, and, in 2014, a sudden avalanche killed 16 Sherpas here. “People notice and document the retreat of the glaciers, but what makes them more dangerous is that they are growing thinner, which makes them more likely to collapse. This would happen once or twice a day in the past, but now, they collapse every hour as they grow weaker. This leads to more icefalls, avalanches and crevasse formations on the glaciers," All adds. The bigger issue, according to Viesturs, is the effect of climate change on local populations. “Once the glaciers vanish, the main sources of water that feed the rivers will dwindle and lead to mass migration in the future," he says. High up on the mountain too, conditions have changed. “The ice and snow have reduced between the South Summit and the actual summit in the last decade. As a result, we’ve had to change the route over this stretch," Mingma says. Viesturs has observed that in the Alps, traditional snow and ice routes have become rock climbs in the summer. “Many routes on the Everest, like the West Ridge, are probably impossible to climb now because of this change from ice to rock. This is happening around the world—many of the routes in guidebooks for places like Cordillera Blanca in Peru are no longer possible to climb. There are talks about a potentially new breed of climbers trying these new rock routes, provided that the rock is good in these places," All says. “Snow cover can make certain sections of a route easier, what otherwise would have been a challenging rock climb. Sherpa climbing guides are already complaining, and, most likely, it will only get worse," Byers adds. Certain approaches to the Everest remain of interest to mountaineers. According to Dujmovits, the Everest-Lhotse traverse, the horseshoe traverse of Nuptse-Lhotse-Everest and the Fantasy Ridge route on the East Face of the Everest are just some of the challenges that the mountain poses to climbers. Then there is winter climbing, which mountaineers like Alex Txikon continue to chase. Despite two unsuccessful attempts on the Everest, the last in December, the Spanish climber believes these are worthwhile mountaineering objectives. “There are a lot of other possibilities that come alongside the crowds in spring. Besides, I don’t believe in climbing during a certain time just from a marketing point of view. It’s a personal choice and a lifestyle, despite really difficult conditions on the mountain during winter," says Txikon, who was also part of the team that made the first winter ascent of the Nanga Parbat in 2016. Commercial climbing seems certain to thrive on the standard routes, for now. In fact, efforts are on to make summiting even easier by using helicopter shuttles to move gear to higher camps, as well as greater use of oxygen. All points out that there’s an increase in the use of drugs that allow climbers to move more quickly—it is, he says, becoming a major problem, and will only grow in the future. On the other hand, there have been calls to close the Everest to climbing for a few years, but with the amount of money at stake, that seems unlikely. Besides, few things can sate personal ambitions the way standing atop the Everest does. Or as Scott says: “I’m sure clients will never forget the experience if they reach the summit. They do, after all, still have to put one foot in front of the other."